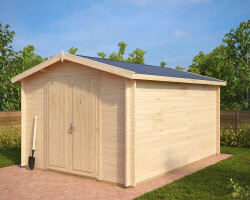 All our garden storage sheds and workshop sheds are high quality, flat pack, log cabins. 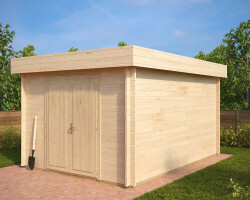 Like all our other wooden garden buildings, they are built without any compromises. 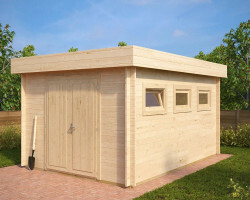 These multipurpose storage and workshop sheds are made of finest Nordic spruce. They offer the extra space you need for your latest DIY projects or a place to store your bikes, tools, and garden equipment. 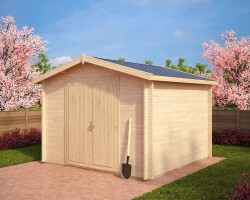 These supercharged wooden garden sheds come with 28-40 mm walls, impregnated foundations beams, solid wooden flooring, roof boards, wind braces, assembly kit, and roofing felt. Hansa Garden flat pack log cabins are mostly one or two-day DIY projects for two persons to build your own shed. All our wooden sheds are designed with the great care to add natural beauty to your garden. 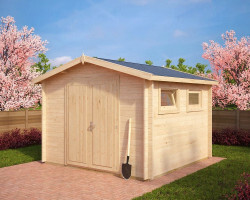 Our range of wooden garden sheds start with small 6×6 storage sheds followed by 8×6 and 10×8 sheds and finally 14×10 large garden sheds. Most of our storage sheds have double doors. For big-time gardeners, we have a few double sheds to offer. 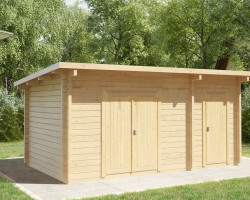 A double shed is the smart way to keep your garden equipment in order and find things quickly and easily. 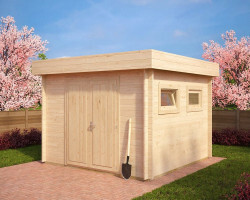 You can also use one part of the cabin as a storage shed and the other half as a workshop.